Explanation: Will the Hubble Space Telescope (HST) end up in a museum? Probably not, as when it finally goes bust, current plans call for it to be de-orbited into an ocean. But this won't stop likenesses of the famous floating observatory from appearing in science museums around the globe, sometimes paired with amazing pictures it has taken. 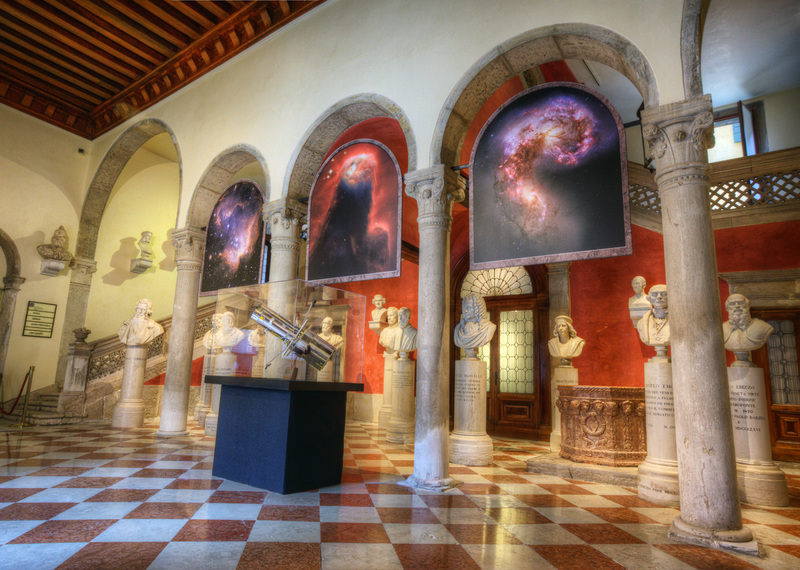 Pictured above, in a celebration of the 20th anniversary of the launching of Hubble, a replica of the telescope was given a picturesque setting in the Italian Istituto Veneto di Scienze, Lettere ed Arti in their beautiful and historic Palazzo Loredan. The scene there appears perhaps a bit surreal as the deep space imager appears over a terrestrial tile floor, surrounded by the busts of famous thinkers, and under arches reminiscent of Escher. If you're lucky, it may even be possible to find an exhibition of Hubble images near you. And if no HST model appears there, you could always build your own.